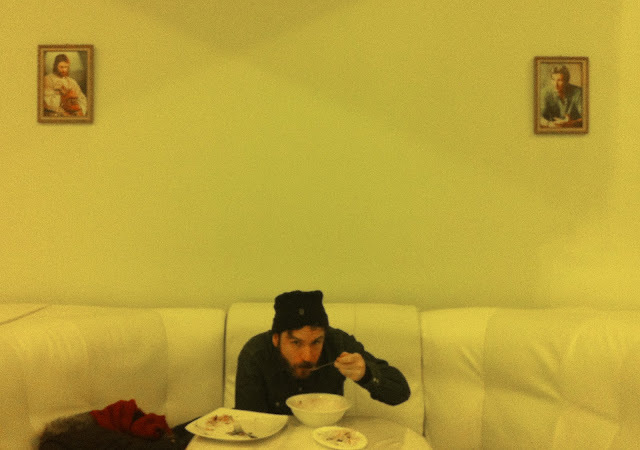 Matt eats while being watched over by Jesus and Richard Gere, naturally. The Mongolian language is not easy for someone who speaks English. Many of the words sound like Sylvester The Cat. We were only able to really learn 2 words here: hello: sam-an-o; and thank you: bay-arl-a-laa (with that corner-of-the mouth sucking 'shhh' sound added somewhere towards the end of the word). Luckily, pretty much everyone we encountered knew those words, and more in English. While there are buses and taxis, most people just approach the street and wave a hand and pretty much any car stops. Passengers pay the driver a somewhat standard fee per km. It is bizarre to me, but totally normal here. Crossing the street is very exciting in Ulan Bator. Yes, there are crosswalks. Yes, there are stoplights. But it barely matters. Cars will simply keep driving, whether a person is in the way or not. It is like being in the later levels of Frogger. There are vendors on street corners. The term vendor being used generously. It's usually an older woman sitting with a crate in front of her. On display are cigarettes, both in packs and individuals, roasted pine nuts in plastic solo cups, gum, and a telephone. When I witnessed someone approach the vendor, hand her some money and start dialing I was very confused. It was a large, non-cellphone, landline-looking telephone. Maybe it is a kind of old-school mobile phone, but honestly, I am still trying to understand this one. Many of these vendors also have a scale. Not the kind you would weigh pine nuts with, but the bathroom kind. I'm not sure if they will guess your weight, or just weigh you for a fee?